I haven't used my laptop in a while. My desktop runs XP and I don't need another Windows computer. I wanted to make my laptop run some form of UNIX variant, whether it be Linux or BSD, I didn't care, as long as my wireless worked. Well, that was the roughest part. I tried Fedora Core 4 and 5 and also Knoppix 4. I couldn't get the wireless (Intel 2200BG) to work at all. I tried getting precompiled drivers, compiling them myself, and I even tried using ndiswrapper. Nothing... But Fedora Core 6 came out a few days ago, so I downloaded the DVD and decided to give it a shot. At first, no luck. So I searched the internet trying to find anyone who got thme to work. I found a forum that had instructions, so I tried them. Nothing... Then I found another post that said similar things, but mentioned some other default programs that are supposed to handle network connections. In the end, it was as easy as installing the livna repo, installing the ipw2200-firmware package, chkconfig'ing NetworkManager and NetworkManagerDispatcher on, then rebooting. Then I ran neat (shorthand for system-config-network), added a new device (eth1), and then used NetworkManager (which put a nice little icon in the "system tray") to connect to my AP. It works great now, actually, I'm on the laptop right now writing this. So the network works, but I had another reason for trying Core 6, the effects. My laptop has an ATI 9200 in it, which isn't great, but it's enough to do some basic 3D effects. 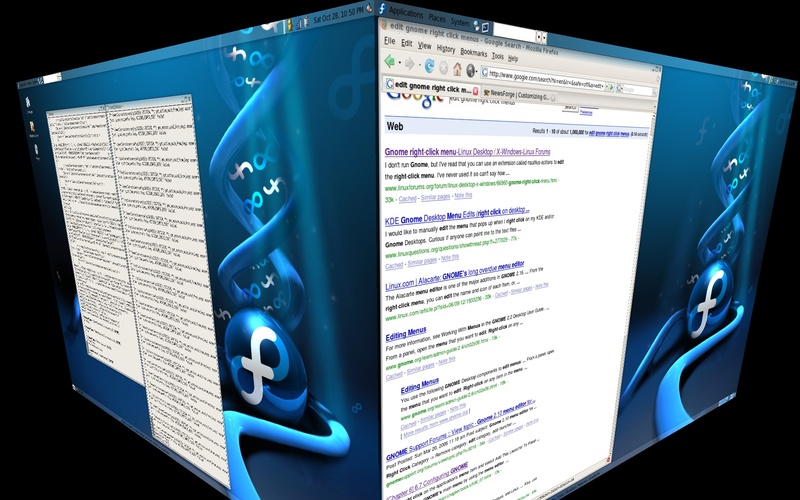 Core 6 comes standard with compiz ready to go. So I logged in (using gnome) and clicked the button to enable desktop effects. Now I have wobbly windows when I move them and a 3D cube for my workspaces. Here is a screenshot of me going between two workspaces. For those of you non-UNIX people out there, you might not know the concept of workspaces. With Windows, you have one desktop, and all the apps you have open are used on that one desktop, so you need to get good at minimizing and placing windows so you can make the most of your limited space. With most UNIX window managers, you have an indefinite number of workspaces, or desktops. So if you're working in five applications at the same time, you don't have to keep four minimized to work in the other. You can have five workspaces with one application maximized on each workspace. Then it's as easy as CTRL+ALT+LEFT or RIGHT to get from one workspace or another. I don't know what I'd do without them. In the screenshot above I'm compiling/installing software on the left workspace and browsing the internet on the right workspace. As you can see from the "system tray" I have gaim open, NetworkManager handling my wireless, and I'm running on AC power. So yeah, now I can actually be productive with a real system, not that Micro$oft crap!